A number of wristwatches have been worn in space, but none are as famous as the Omega Speedmaster Moonwatch. The Speedmaster was first launched in 1957 and was originally designed as a sports and racing chronograph in conjunction with Omega’s partnership as the official timekeeper of the Olympic games. It was powered by the manually wound Omega caliber 321, developed in 1946 by Albert Piguet of Lemania, which had been acquired in 1932 by Omega’s parent company, SSIH. The model featured a 12-hour, triple-register chronograph layout, domed Hesalite crystal (plexiglass), and high-contrast indexes. Prior to the Gemini IV space mission, the Omega Speedmaster Professional was subjected to a series of rigorous tests conducted by NASA including temperature, oxygen, shock, acceleration, pressure, vibration and noise. Up against brands such as Rolex, Breitling, and Longines – the Omega Speedmaster, which finished with rate results of approximately 5 seconds per day, was selected. In 1965, the Omega Speedmaster was worn during the Gemini IV space mission, which was NASA’s second manned space flight, and more importantly the first spacewalk by an American. The subsequent Apollo 11 mission, in 1969, was, of course, the most famous, as it represented the first humans to walk on the moon. This is how the Speedmaster gained the Moonwatch designation. A cool fact, often overshadowed by the Speedmaster’s use during the first lunar landing, is its crucial importance during the re-entry of the Apollo 13 space shuttle. In 1970, after Apollo 13 was crippled by the rupture of a service module oxygen tank, Jack Swigert’s Speedmaster was famously used to precisely time the critical 14-second Mid-Course Correction 7 Burn (re-entry timing), allowing for the crew’s safe return. 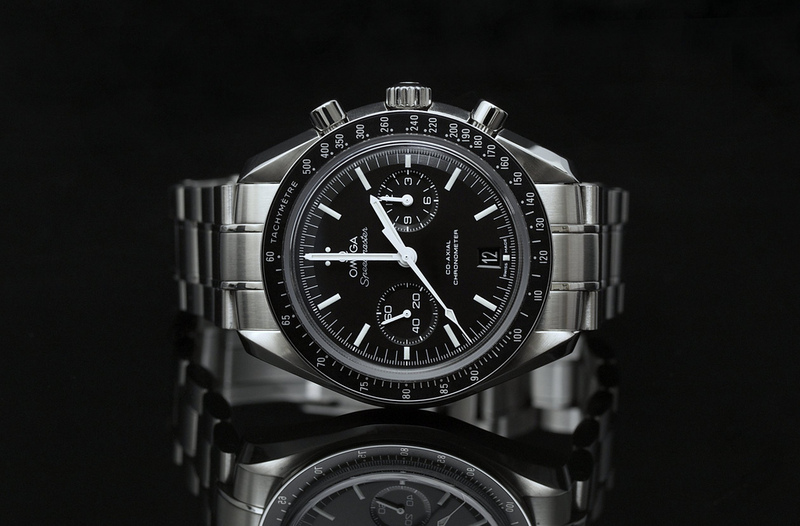 The Speedmaster Professional still remains one of several watches qualified by NASA for spaceflight. For 2011, Omega introduced a new variation of the Moonwatch. The new Omega Co-Axial Chronograph does not have a manual wound movement like the one worn by Buzz Aldrin on the moon in 1969, nor does it have the shatterproof Hesalite crystal, triple register chronograph layout or the 40 mm – 42 mm case diameter (depending on which older version), still it is unmistakably a Speedmaster Moonwatch. The new modern Moonwatch now features a 44.25 mm diameter steel case, a scratch-resistant convex sapphire crystal with anti-reflective treatment on both sides and a new two register chronograph layout that combines the hours and minutes into one subdial. The lume filled markers and hands look just like the original. Apart from the slightly new design, the biggest change is the addition of Omega’s new caliber 9300, COSC-certified chronometer, in-house self-winding movement with a column-wheel mechanism and Omega’s proprietary Co-Axial Escapement. It utilizes a high-tech silicon balance-spring on a free sprung balance, along with two barrels (allowing for a 60-hour power reserve) mounted in series and automatic winding in both directions (most automatics wind in one direction) to reduce winding time. The movement, which is visible through a convex sapphire crystal case back, has a rhodium plated finish with exclusive Geneva waves in arabesque. More than 50 years from its original introduction, the Speedmaster Moonwatch is still the most iconic and recognizable of all Omega models; maybe even the most recognizable chronograph wristwatch of all time. (Ref. 311.30.44.51.01.002) The retail price is $8,700.